Our big swimming pool is very popular. It's 12m long, 6m wide and 3m at the deep end. The grounds and pool are all clothing-optional so you can be naked at The Lotus Tree as much as you like. But if that's not your thing, no need to worry, you'll be just as comfortable whatever you choose to wear - or not to wear! Our garden is eight acres (four hectares) and is not visible from the road. It's alive with colour and butterflies in the early summer and the noise of cicadas when the weather gets really hot. Around the pool there are stylish sun loungers, hammocks, and plenty of parasols for when the sun gets really hot. Summer temperatures are generally around 30C so our pool is always a popular place to hang out. 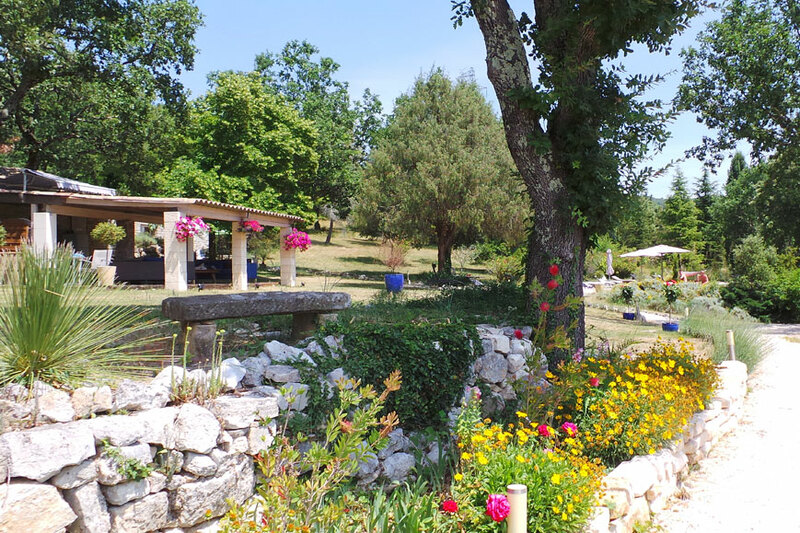 It helps make The Lotus Tree the most popular gay bed and breakfast in the South of France. Breakfast is served outdoors and the large Lotus Tree garden is perfect for a barbecue or for a meal and a party with the other guests. We'll organise everything so you can relax and have fun. If you want a rest from the sun, you can take it easy in our summer lounge. It's a great spot to meet the other guests, or to share a drink before dinner (or after or both!). And there are plenty of places in the garden to sit quietly with a book or your iPad. The only thing to disturb you will be the sound of the crickets or the singing of the birds. Or maybe our friendly Labrador, Jake! In spring the gardens are full of wild flowers, including orchids. By June the lavender is coming into flower. The wild herbs give off an aroma at all times of the year and there's an olive grove and some young truffle oaks among the huge variety of trees.